I was feeling tired of gray winter (and, really, other than being cloudy a lot of January, we have not had much bad weather…so I SHOULD NOT COMPLAIN!). I pulled out an old favorite floral set (Paint Prints – 2005 Sale-a-bration, I had to go look it up! ), and some retired colors, and stamped a background. The flower centers were stamped with VersaMark and embossed with Ranger Silver Pearl embossing powder – you can really see their sheen on the top left of the card. Last night, while changing into my pajamas, I had turned on the TV and flipped past QVC. I am not a big QVC watcher, but Isaac Mizrahi was on, selling “extra long tank tops”. In the exact colors of the card I made. So glad I have not gotten rid of old ink pads – the color wheel spins around again in time! Supplies: Stamps – Papertrey Ink, Stampin’ Up!, paper – Neenah Classic Crest Solar White, Stampin’ Up! Barely Banana (retired), Cameo Coral (retired), Cool Caribbean (retired), Whisper White, inks – Stampin’ Up! Barely Banana (retired), Cameo Coral (retired), Certainly Celery (retired), Cool Caribbean (retired), VersaFine Onyx Black, VersaMark, dies – Lawn Fawn, embossing powder – Ranger Silver Pearl, organdy ribbon – Offray. 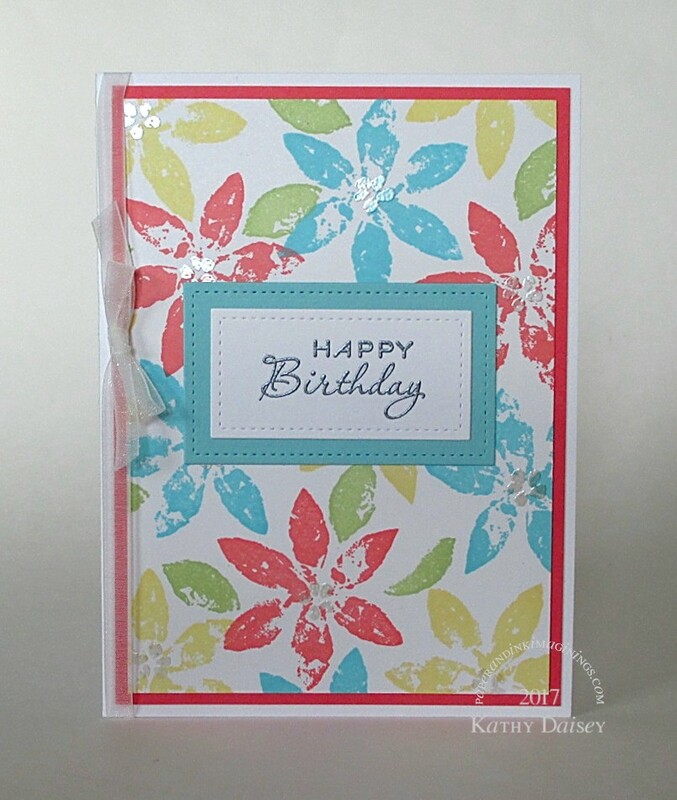 Categories: birthday, card | Tags: card, Lawn Fawn, Neenah, Offray, Papertrey Ink, Ranger, Stampin' Up!, Tsukineko, VersaFine, VersaMark | Permalink. I believe that is called being fashion forward! Luscious, seaside-y shades, working perfectly with your stamps. Most cheery! I was going for most cheery! Thanks, Gillian! Oh, thank you so much, Mrs. Craft! Love the colours! We’re (impatiently!) waiting for spring around here! Thank you, Melissa-Ann! Spring needs to come – ignore the groundhog!